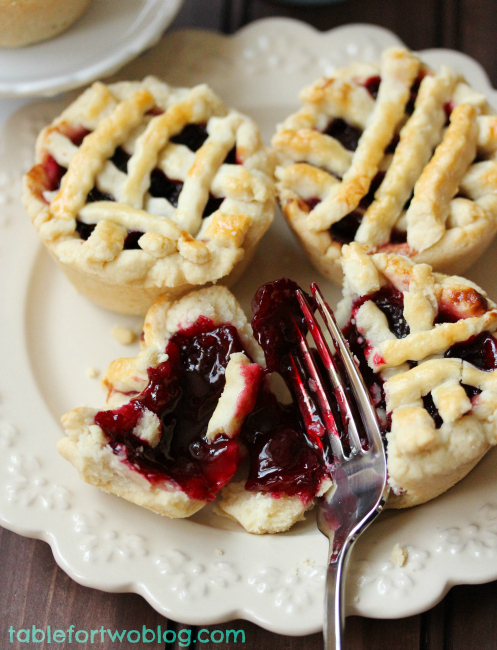 These mini cherry pies have all the deliciousness of regular cherry pies but look a lot cuter! These pies are special mini pies. They definitely were a labor of love but they were oh so worth it. 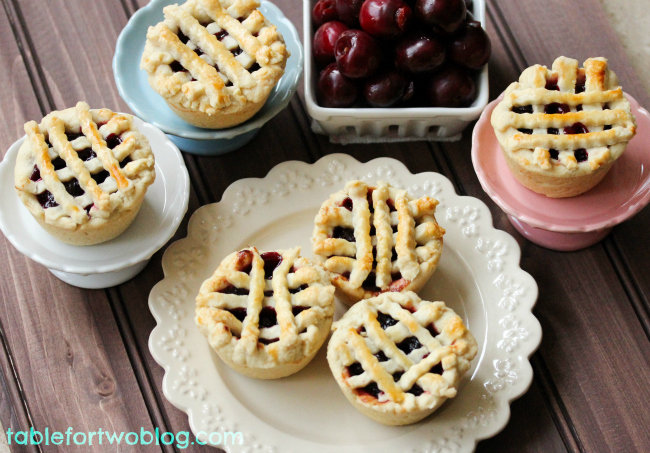 The cutest mini cherry pies! Everything is better mini! In a food processor, pulse together the flour and salt. Then with the food processor on, drop the cubes of butter through the feed tube, one by one. 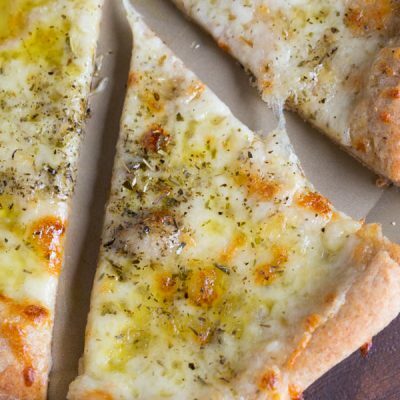 You'll want the dough to be pea-sized crumbs. Then pour in the ice water through the feed tube and the dough should be ready! If it's still too sticky or crumbly, add a bit more water, but by the tablespoon. Dump the dough out onto the counter and halve the dough, placing each halve in saran wrap. Place in fridge for 1 hour or overnight. While the dough is chilling, you can make the filling. In a small pot on the stove, drop in your cherries, sugar, and lemon juice. Cook on medium low heat for 12-15 minutes until the cherries are soft and can be mushed down. The filling will still be too liquidy so make a cornstarch slurry (a few tsp. of cornstarch with some water) and pour it in the pot. Stir until it thickens up nicely. Set aside for it to cool. Preheat oven to 375 degrees and lightly grease 6 muffin cups in your muffin pan. Once dough is ready, roll out one half on the counter top and cut out circles with the largest biscuit cutter you have or use the top of a drinking glass - it just has to be larger than your muffin cups. Place the circles in the muffin cups and crimp down the sides. Place the cooled filling into the cups, almost until full. Take the other half of the dough and roll it out. Using a ravioli cutter, cut thin strips of dough to create a lattice pattern on top of the mini pies. Once you're done assembling, beat an egg and using a pastry brush, brush the tops of the pies with the egg wash.
Bake in oven for 30 minutes or until they're nice and golden brown on top. Let sit in muffin pan for 10 minutes before trying to remove from pan. So you organised this shindig and then made adorable little pies for us all to eat?! You are the best! Love love love this! You are the sweetest, Julie! Megan is so lucky to have you as a friend. And these pies are just darling! These look delicious, I might make them for my Dad, he loves cherry pie! These are gorgeous Julie! Love the lattice!! These are gorgeous! How sweet of you girls to do this for your friend. That’s just awesome! And congrats to Megan! Whoo!! Not gonna lie, Julie…. when I saw that first photo of your pies, my jaw dropped. Absolutely gorgeous! I love cherry pie, and your petite beauties are just stunning. Thank you so very much for organizing this shindig with Cassie. You two really rocked this. I wish I could see Megan’s face while she’s going through all of these recipes. More than that, I wish we could have all been in one big room today! That would be one heck of a food table, and the idea of all of us in one room celebrating Megan’s big day brings tears to my eyes. Great job! Julie these are totally adorable. I need to make these asap. Then eat them all by myself. Then fall on the couch in a cherry pie coma. Thanks for all the hard work you put into putting this together. It’s been an absolute pleasure being involved. These are so freaking cute! Mini pies are just plain awesome. Girlfriend – You are a rockstar and a half!! Thank you for all of this, like really really. My phone started buzzing about 4 am and I was wondering “Who the hell is blowin’ up my Twitter so early in the morning! ?” BEST Surprise EVER!! Thank you thank you thank you! I love all of this. And now that I’m sufficiently starving for pie, cookies, Eton messes, booze and noms at 7:30am I’m going to try and make it through the workday without trying to lick my computer screen…not likely. XOXOXO I luva ya! 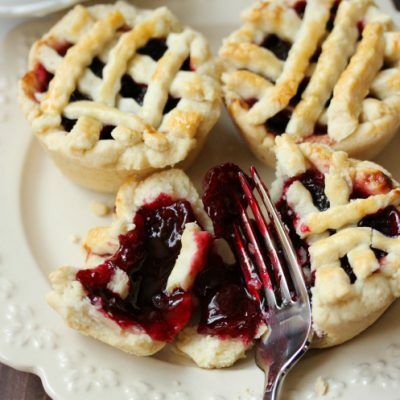 These pies are too adorable! I’m going to a bridal shower in a couple of weeks and I most definitely will be bringing these. I may even try out a couple of different fruits :) Pinned! Cherry pie holds a special place in my heart. Your mini pies are perfect! These pies are so cute!! And huge congrats to Megan! These are just the cutest little things I ever did see! Those are the cutest little pies ever!!! What a fun surprise party for your friend!!! These are so cute! I’ve seen them around the interwebs and have them on my (long!) list of things to bake. What a great surprise for the virtual bridal shower! Awww you girls are just too sweet! And these cherry pies are freaking adorable! I love that you put them on mini cake stands = super cute! These are beyond cute! I can’t even make a normal-sized pie look that delectable…way to go! I love the idea of a pie on the go because it’s so perfect for a party. That way you can hold your pie in one hand and your champagne in another. Brilliant! Wow, these must have taken quite awhile to make Julie! But they are so worth it! Adorable! Adorable! So perfect for shower. Congrats Megan! These are absolutely perfect! Can’t believe you did the lattice top on each one, that must have taken forever! These cherry pies are so freakin adorbs. I want them in my belly! LOVE. Thanks for rallying the troops for Megan’s day. It was a ton of fun!!! These are so stinking adorable!! I’m so glad we pulled off the surprise. Now, to make these pies!! These are SO CUTE! You did a beautiful job! What a fantastic and sweet idea to do a virtual bridal shower! 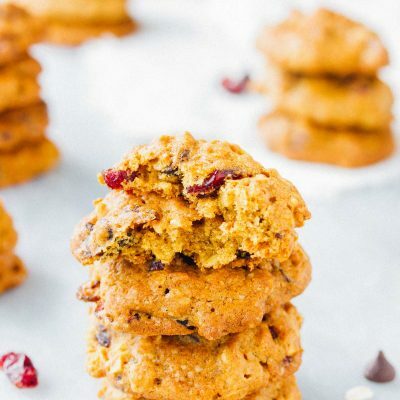 These look soo delish! these are adorable. 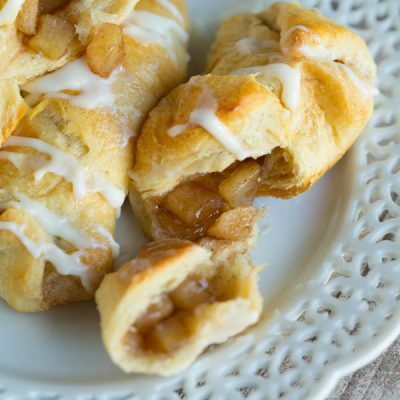 the crust looks so buttery good, and the filling is so gooey. yum! These look so delicate! (and tasty!) I can’t believe how cute they are! Yes, cherry pie is an all-time favorite. Yes, like most women I have a yen for tiny things. BUT YOU MADE TINY CHERRY LATTICES. Mind = Blown. And I’m not even ashamed to admit it. This was such a lovely idea! These pies are so cute. Congrats, Megan! You girls are all SO sweet! CONGRATS Megan! These are so darn cute! And the look so yumtastic! I’m really starting to regret looking through your recipes. I’ve already had dinner, but now I’m wanting more food. Especially one of these babies. Lovely, lovely. This is the cutest idea ever! Megan is such a lucky friend to have a large virtual bridal shower. These looks amazing! 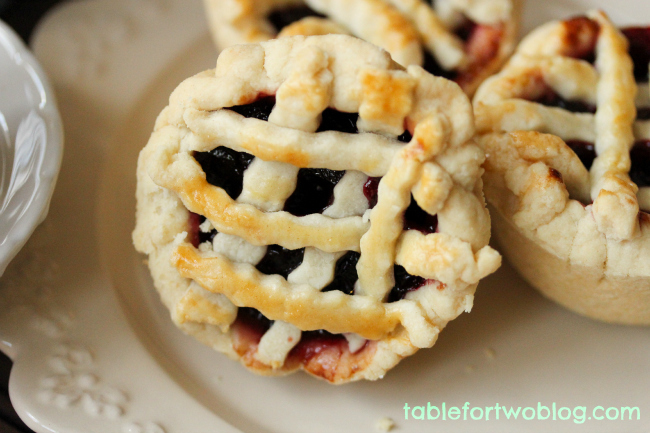 Has anyone tried these in a mini-muffin pan to make bite-size cherry pies? Just wondering how they would turn out. LOVE the idea of mini pies! These are so cute! Is there a particular reason you only did 6 and not 12?